Summer vacations in the USA call for long days at the beach, boat trips on the lake and lots of time enjoying the great outdoors. But nothing ruins the fun of a relaxing summer getaway like long lines, traffic and too many towels laid out on the sand. If you’re looking for a quiet place to get away this summer, with fewer crowds to dampen your holidays but plenty of activities to fill your days, check out the following five destinations recommended by travel bloggers (plus a bonus suggestion at the end). From a tiny island in Florida that says goodbye to most tourists after winter, to a remote park in Nevada with mountains and alpine lakes, these vacation spots are ready to welcome you this summer. This post contains affiliate links, which means that if you click on or buy something, we might receive a commission for telling you about it, at no extra cost to you. Mammoth Mountain is the “go to” ski resort for Southern Californians. There are other ski areas located closer to Los Angeles but Mammoth is considered the real deal. In winter, all you hear at work is people making plans for the 300-mile drive to the mountain. However, let me tell you a little secret — Mammoth is open for business all year round and it becomes a hiking, fishing, biking and boating paradise during summer. Even better, you will not have to deal with crowds or traffic jams! While there, you can visit the Basin area with easy access to five lakes: Twin, Mary, George, Mamie, and Horseshoe. Well-marked hiking trails lead to other lakes and mountain passes. The Minaret Vista, Agnew Meadows, Devils Postpile National Monument, Rainbow Falls and Reds Meadow are reachable during summer too. After a day enjoying the outdoors, you can stop by the town of Mammoth Lakes to dine, bowl, watch a movie or relax. If you are interested in day trips, make sure to check Mono Lake or Yosemite National Park. Follow Tanama Tales on Pinterest. Search for resorts and lodges in Mammoth Lakes at Booking.com. Sanibel Island is a quiet and serene summer vacation destination. Since it’s located off the coast of southwest Florida near Fort Myers, you’d think that it would be incredibly busy during the summer, but it’s surprisingly quiet. Sanibel’s busy season is actually in the winter, which makes it the perfect summer escape. Sanibel is a small island (about 12 miles long), with no traffic lights and no high-rises, which makes it feel even more quaint. Due to its size, the best way to get around is by bike, and there are plenty of rental shops on the island if you can’t bring your own. Although the island is small, there is no shortage of things to do. You can spend your time relaxing on the beach, searching for shells, watching the sunset over the ocean, exploring a nature preserve, perusing local shops, gliding through the water in a kayak or on a paddleboard, and so much more. And, perhaps best of all, there are tons of quirky restaurants that serve fantastic food. So, skip the busy season and visit Sanibel in the summer. Not only do you get to enjoy summer-exclusive activities, but you don’t have to wait in long lines or be around too many people. Sanibel might just be the perfect summer getaway! Follow Roads We Wander on Pinterest. Search for beachfront accommodations on Sanibel Island at Booking.com. Situated on the Neuse River along the central coast of North Carolina, New Bern is about 40 miles inland from Morehead City and the beaches of the Bogue Banks. It is a beautiful and historical town with a claim to fame as the birthplace of Pepsi. Since most people choose to go to Atlantic Beach or other nearby barrier islands, New Bern stays fairly peaceful year round but offers plenty to see and do without the extra people and traffic. The Neuse River here offers access to swimming, boating, fishing, ferry tours and so much more. There also is a scenic city park with a pier and benches to sit and enjoy the sunrise. You will find many picturesque historical homes just walking through the streets, but history buffs might enjoy a visit to New Bern Battlefield Park and Fort Macon State Park, both free of charge. The North Carolina History Center and Tryon Palace also are a must. Tryon Palace lets you take a step back in time to the 18th century, when New Bern was North Carolina’s first capital. Actors in period clothes give tours and run exhibits and demonstrations, with a kitchen building, blacksmith shop and stables open for visitors. You may also wander freely through the elaborate gardens. Whether you are taking the whole family or planning a romantic stay with your partner, there is something for everyone in New Bern. Follow Mid-Life Milestones on Instagram. Search for hotels and bed and breakfasts in New Bern at Booking.com. The Hudson Valley in upstate New York is a quiet alternative to the hustle and bustle of the big city. It is comprised of the communities surrounding the Hudson River and stretches from Westchester to Albany. A variety of small towns here, such as New Paltz and High Falls, offer an incredibly peaceful getaway. Summer is an ideal time to visit since the weather is warm and the local college students have mostly headed home. If you want to relax, the rolling hills covered in wildflowers make the perfect backdrop, but the area also offers a lot to do, including a variety of outdoor activities. There are many options for hiking, biking, kayaking in the Hudson River, and even horseback riding. One highlight is the Storm King Art Center, a massive outdoor art and sculpture museum. It’s a great place for a picnic and to take in the beautiful surroundings and art. There are also renowned restaurants to try in the Hudson Valley, such as Blue Hill at Stone Barns which has been featured on the Netflix series “Chef’s Table.” Overall if you’re looking for a quiet spot to enjoy nature and some great food in summer, you won’t be sorry with the Hudson Valley. Follow Oz and Other Places on Instagram. Search for inns and hotels in Albany at Booking.com. Great Basin National Park is a literal slice of paradise in the middle of nowhere Nevada desert. And I mean the middle of nowhere as in along a stretch of highway known as “The Loneliest Road in America.” When you think of Nevada, you think of Las Vegas and the desert. Well, Great Basin is in the desert, but it’s also in a mountain range, making it a totally different Nevada experience of alpine lakes and the oldest living trees, bristlecone pines. 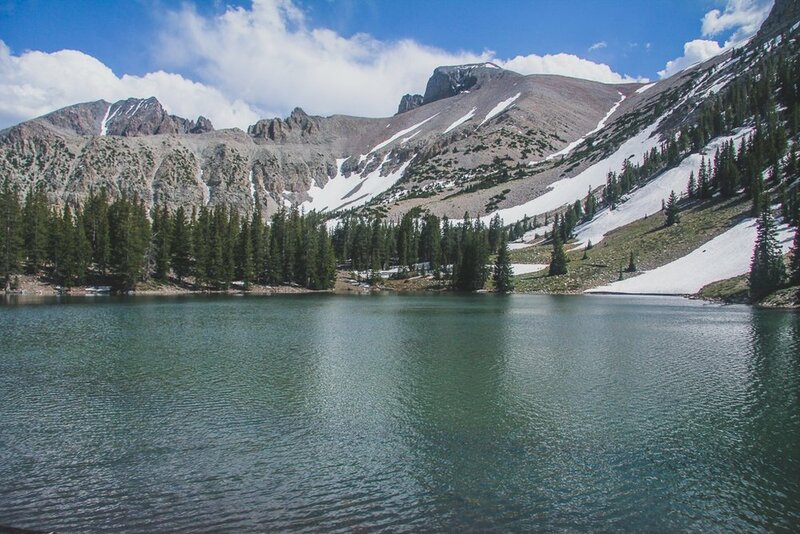 Great Basin is one of the least visited national parks in the US, with less than 170,000 visitors in recent years. Once you see where it is on a map, it makes total sense. It isn’t close to anything, but it is 100% worth the journey. Just outside of the park, the sleepy little town of Baker has a few options for dining and accommodations, or you can stay in the park at one of five campgrounds, which I would highly recommend. Spend some time here hiking to the alpine lakes and bristlecone pines and see the only glacier in Nevada. You can also take a tour of Lehman Caves or head into the backcountry for an even more secluded experience. Follow Red Around the World on Facebook. Search accommodations near Great Basin National Park at Booking.com. Looking for more quiet destinations for the summer holidays? We've rounded up 10 summer vacation destinations to escape the crowds in the USA, the Caribbean, Europe and more!